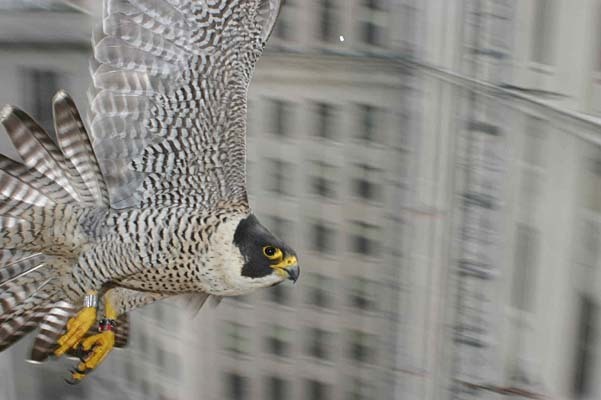 "FalconCams", which are cameras mounted on the skyscraper and focused on the nestbox, are sponsored by the Cleveland Museum of Natural History. They allow us an up close and personal look into the nestbox. To watch the falcons live go to: http://www.falconcam-cmnh.org/news.php Here is a still captured by the FalconCam showing the nestbox just outside the 12th floor window of the skyscraper. If you are new to watching falcons, here is some background. By the 1970’s, the species peregrine falcon had nearly become extinct in North America because of the use of a pesticide called "DDT". In 1972 DDT was banned in North America and for many years, scientists and people from all walks of life worked hard to save the species. In 1999 the peregrine falcon was removed from the List of Endangered Species, one of the great success stories in the field of wildlife conservation. 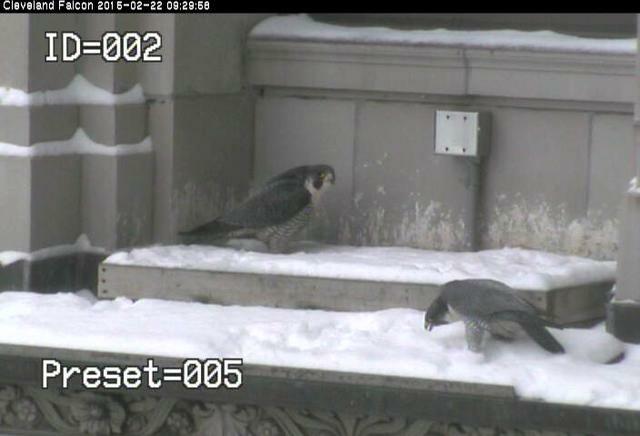 Today we are seeing more and more falcons as the species recovers. This means that there is more competition for prime nestsites and mates. It is survival of the fittest for these fierce birds. Stay tuned for falcon news……..
To watch the falcons live go to: http://www.falconcam-cmnh.org/news.php Our thanks to the Cleveland Museum of Natural History for sponsoring the FalconCams and for the still. Thanks to Mr. Scott Wright for his photographs of SW, Boomer and the FalconCams. Thanks to Mr. and Mrs. Saladin for the photos of Newton and the unknown female. and you will see a wound above her beak. This is one of the clues that she may have battled with SW. Also, there was only a two-day gap between the last time SW was photographed at the nestsite and the first time that Newton was photographed there. The peregrine falcon is a fierce predator and will fight to the death if necessary. 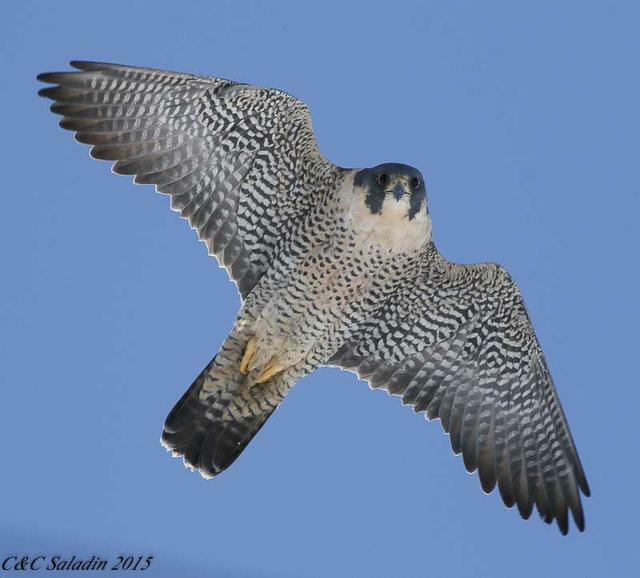 Welcome to the 2015 nesting season starring the peregrine falcon – fastest creature on earth! 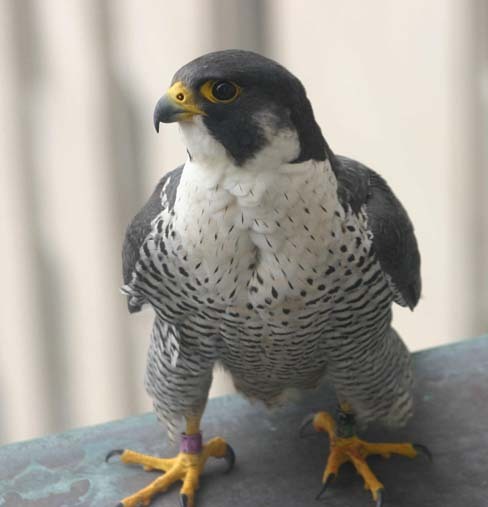 We will study and watch one peregrine falcon family during nesting season, approximately late February into June. Our study family nests on the 12th floor ledge of a skyscraper called "Tower City" in Cleveland, Ohio. SW was the resident mother falcon for the last 12 years, but she disappeared in late July and was found dead in September. Many of you watched SW hatch and raise 38 chicks at this nestsite over the years. She was fierce and brave and a wonderful mother. In the picture you can see Boomer bowing to Newton who is in the nestbox. This is “courting” behavior. 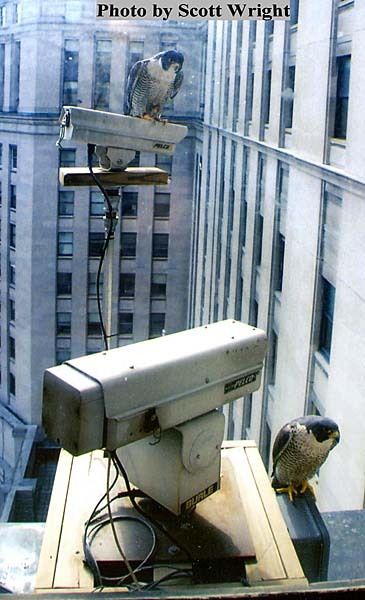 The following picture was taken from inside the skyscraper window The falcons are perched atop the FalconCams". Will Newton keep control of her nest and mate? Is Newton too old to lay eggs? If she does, will they hatch? 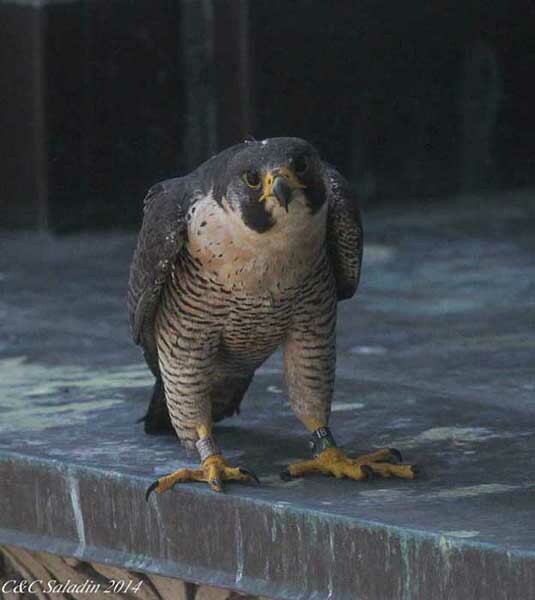 You may think it's winter, but peregrine falcons are thinking spring, and they have already begun the annual nesting life-cycle: courtship, rivalry, survival, new life, parenting. We hope you will enjoy studying this magnificent species that escaped extinction and now rules city skies. Newton has been bonding in the nestbox with Boomer, SW’s former mate. Here is Boomer, the father falcon, on the skyscraper ledge near the nestbox. Boomer is young and strong. Newton is an older female. Recently, a young unbanded female has been seen in the area. Is she challenging Newton for the valuable nesting territory and for Boomer as a mate? Here is the unknown female.